Hi there! Well, I have no particular excuse for not posting in nearly a month. I've been busy as we moved AGAIN, but it didn't really stop me from trying new recipes. I also got a new camera for my birthday, but I'm still getting the hang of it so this shot is taken with my Iphone. Hopefully in April, I'm get back in the swing of posting regularly. Onto today's recipe. Spring has come super early this year. In March we had a string of days with nothing lower than the 70s. A "cold" spell has hit recently, so we've been in the 50s and 60s. Still, with longer days I'm making dinner later and later it seems. Thus, I've looked for quick, lighter fare. This recipe allowed me to use shredded chicken from a whole chicken I had recently simmered with veggies for stock and other ingredients which are regularly on hand. The new recipe is for ranch dressing which I found from Ellie Krieger at the Food Network. It's super simple and turned out very nicely. I even only had vanilla yogurt rather than plain and it was still pretty good, although I upped the lemon juice and herbs to cover up the vanilla taste. Whisk together all ingredients for dressing except chives and salt and pepper. Season with salt and pepper to taste. 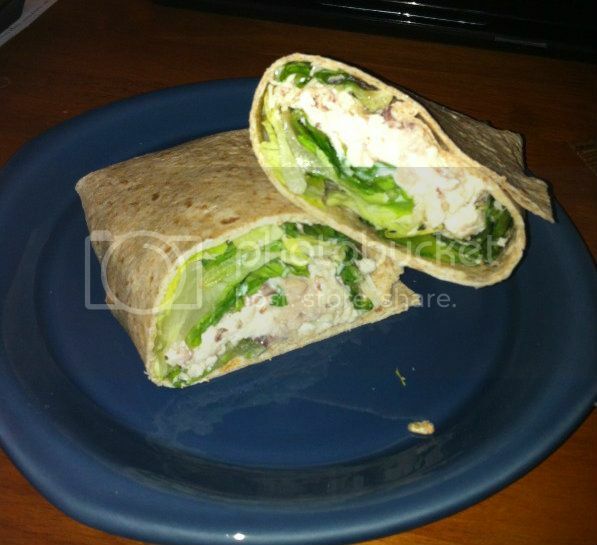 In center of burrito wrap, place handful of lettuce topped with chicken and drizzle of dressing. Sprinkle with cheese, then wrap burrito.